Mumbai, April 5: A message is going viral on popular messaging app WhatsApp claiming a person can cast 'challenge vote' if his/her name is on the voter list. It also claims that a re-polling would be conducted if the booth records more than 14 per cent tender votes. 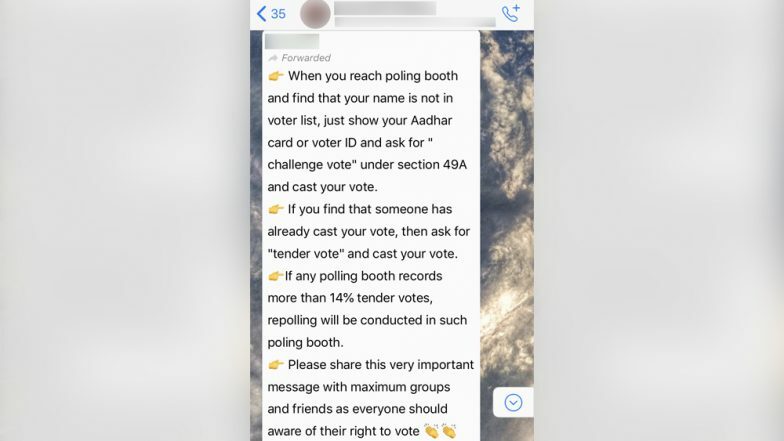 The viral WhatsApp post further claims that a person can cast a 'tender vote' if he or she finds out that someone has already cast a vote in their name. "If you find that someone has already cast your vote, then ask for "tender vote" and cast your vote. If any polling booth records more than 14% tender votes, repolling will be conducted in such polling booth," the viral WhatsApp message claims. "When you reach polling booth and find that your name is not in voter list, just show your Aadhar card or voter ID and ask for " challenge vote" under section 49A and cast your vote," it says. WhatsApp Unveils Tipline to Report Fake News in India Ahead of Lok Sabha Elections 2019. The viral WhatsApp message is partially true. According to the Election Commission of India, a person is entitled to cast a 'tender vote' if his/her vote has been cast by someone else. For this, the person will have to approach the presiding officer who after an inquiry can allow him/her to cast a 'tender vote'. The person will be given a tendered ballot paper. However, these votes are counted only in cases where the margin of votes between candidates is very thin. Another claim about 'tender vote' written on the viral WhatsApp message is partially true. There is no compulsion of re-polling. The part of the message that says re-polling would be ordered if the booth records more than 14 per cent tender votes is completely false. However, ECI official, in 2018 during Telangana assembly polls, had said that "if tender votes constitute more two percent of votes in a polling station, district election authority after scrutiny, can call for re-polling after taking the permission of Chief Electoral Officer of the state". When it comes to 'challenge vote', the viral WhatsApp message is misleading people. A person cannot cast 'challenge vote' if his/her name is missing from the electoral roll. However, a polling agent of any candidate can challenge the identity of a voter on the grounds that he or she is not the person whose name is listed on the rolls. The presiding officer can then ask the challenger to provide evidence in proof of his claim. You can vote if your name is not in voter list. No, you cannot vote if your name is not in an electoral roll.